As you I'm sure you're quite aware, during particular periods of our history, a lady wasn't properly dressed unless she was wearing gloves and a hat. Hmm... I don't even like gloves in winter. I prefer mittens. And a hat? Well, I happen to love hats! Not just structured millinery (Sadly, I own too few of those. ), but also soft slouches, berets, and toques. 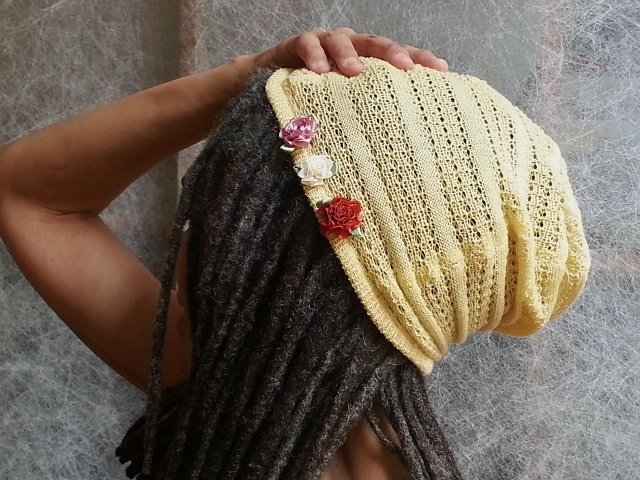 The Seams Like Spring hat falls about halfway between a slouch and a toque, snug around the crown and room for storage in the back. (Yes, I can shove my locs up in there.) It's a quick and easy make, once you get the hang of it. "Seams" Like Spring? Not a misspelling! It's about the seams! 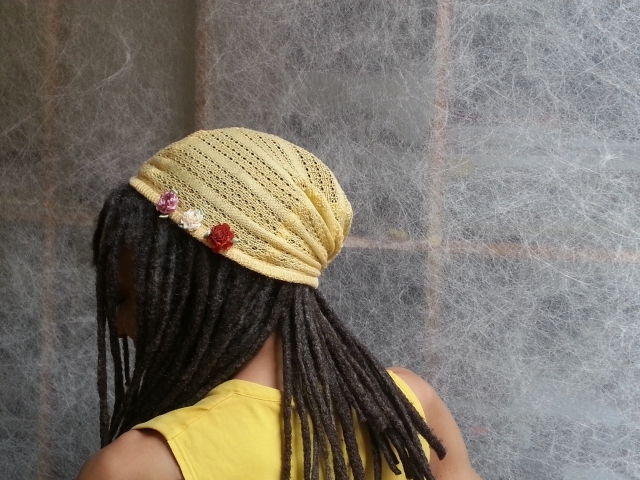 The seams and seam allowances are lightweight, as they should be for my chosen lacy fabric, yet the four seams add stability and a design feature to a stretchy knit hat. And no serger required! Many of my "tutorial" posts have been my sewing notes made public -- yes, lots of notes so I won't forget how I made the thing. When I realized what a good starter project this hat might be for someone who wants experience sewing this type of fabric, I decided to share my pattern too. This project is small, quick, and manageable. Got questions or corrections? Please leave a comment. I hope you enjoy! If you're just doing this for practice and don't care how your hat turns out, because you're never going to wear it anyway, you can skip this section! But if you want to wear your hat, be sure to start with a fabric you love and one that will work for the project. As a textile designer, I feel strongly about this. Choosing the right fabric must always be the first step! This particular hat was designed for a lacy sweater knit, but honestly, any lightweight sweater knit that you love will work. For this pattern just make sure the direction with the least amount of stretch (usually parallel to the selvage) has at least 20% stretch and you're golden. 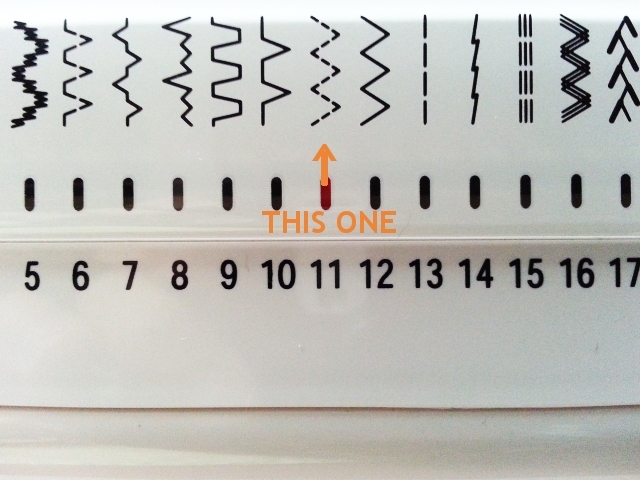 If your fabric doesn't have a selvage (because it's a circular knit), then match the directions of the V-shaped stitches in your fabric (knit stitches) to the V graphic on the printed pattern. The pattern is cut for negative ease. That is, the measurement of your finished hat (unstretched) should be smaller that your head measurement. The finished hat will stretch to fit most heads. You'll notice that I'll always use the word "steam" and never "press" throughout the instructions. For natural fabrics, the "cotton" or "wool" steam settings on your iron are good for steaming. If your fabric has polyester or acrylic, set your iron to the lowest possible temperature that will produce steam, and never ever touch your iron to the fabric. Always hold the iron at least a half-inch above the fabric. 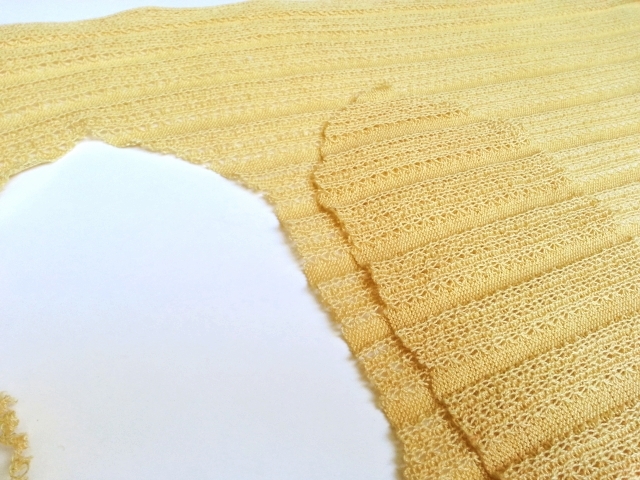 Pressing the iron to a springy knit fabric isn't usually advised. This is especially true for human-made fibers. Is your fabric particularly stretchy and unstable? Is it making you nervous? Spray it liberally with spray starch and then steam it well (following directions in the previous paragraph). Allow the fabric to dry before cutting. The fabric will be a little stiff as you work, but that's ok. The starch comes out in the wash.
A walking foot, a/k/a even feed foot , for your sewing machine is a great accessory. But it's not necessary for every machine. 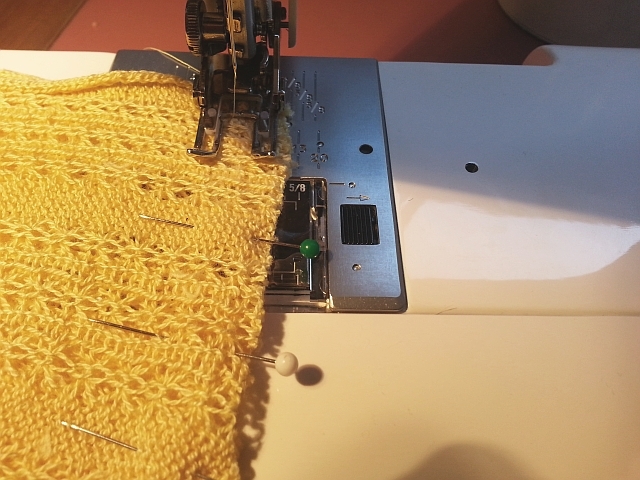 Use a walking foot if you find that your sewing machine stretches your knit fabric out too much when sewing or if the machine starts "eating" the knits. Also reduce the pressure on your presser foot, if possible on your machine. The Seams Like Spring hat pattern - Download Seams Like Spring pattern here. It's free. Follow Steps 1 - 6 to construct the main part of the hat. Click to enlarge pics. Step 1. 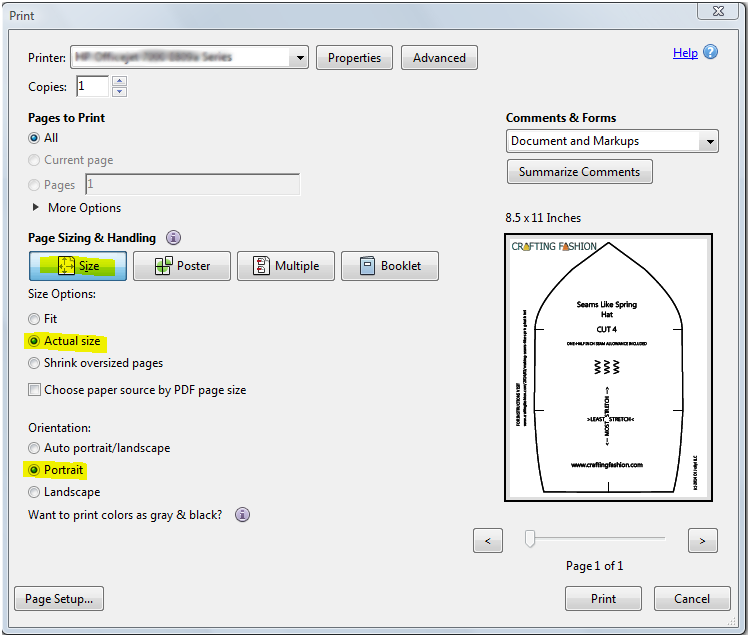 Download and print the pattern piece. Be sure the print settings are to print at actual size. Pattern piece includes a 1/2 inch seam allowance. Step 2. Cut out paper pattern piece (one quarter of the hat) and place on fabric. Use weights to hold paper pattern in place. Unlike the usual layout for a hat (or a sweater), I've placed the bottom of the hat parallel to the selvage. This is because I want the direction with least amount of stretch to go around the head with my lacy, very stretchy cotton fabric. We don't want the hat to become all stretched out after a couple hours of wearing. Keeping the least amount of stretch going around the head and the four strategic seams will help prevent this. Step 3. Cut out one piece from the fabric, and mark pattern piece in the seam allowance, where indicated. Use your fabric marker, chalk, or a sliver of soap to place the 5 marks on each piece. Do not cut into fabric to make notches. Avoid stretching your cut out pattern piece! I find air erasable fabric markers the easiest to use because very little pressure is needed to make a mark. Always test your marker on cutaways before using. Step 4. Lay your first hat quarter on fabric and use as a guide to cut out next pattern piece, matching any stitch or color patterns. Repeat Steps 3 and 4 until all four pieces are cut. Step 5. Sew side seams. Pin first piece and second piece, right sides together, matching marks on side seams. 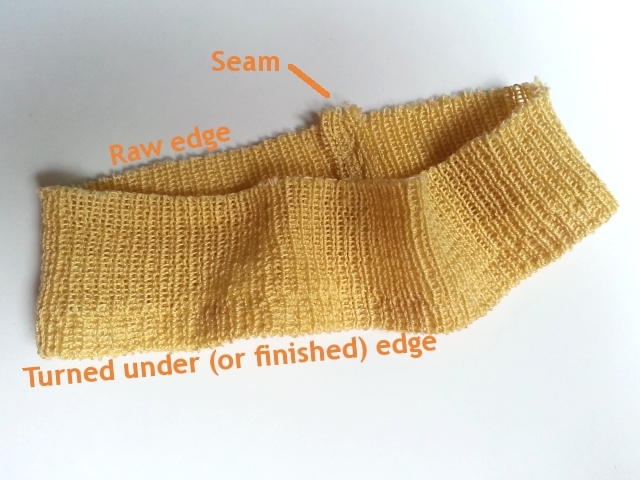 Sew side seam with a 1/2 inch seam allowance using a narrow zigzag of 1.0 mm wide by 2.75 mm long. Remember to move pins before they reach the needle! Steam seam allowance open and flat. Step 6. Topstitch each seam allowance flat with a wide stretch stitch. 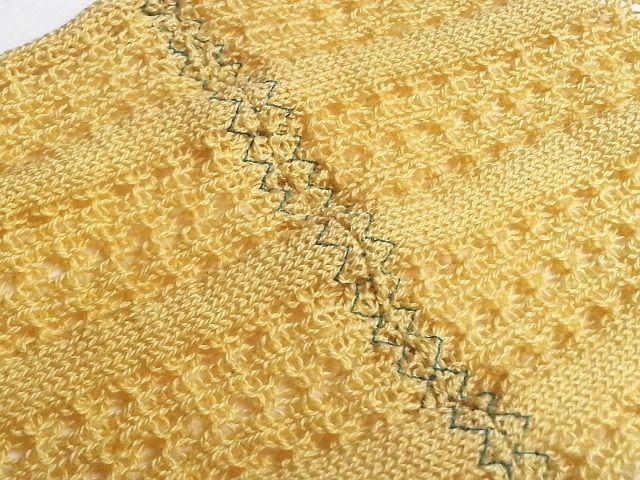 I used a 3-step zigzag at 5.0 mm wide by 1.0 mm long, but a regular zigzag or any stretch stitch that blends nicely with your fabric can be used. Trim seam allowance close to your stitches and steam the seam again. Your topstitching will barely show. 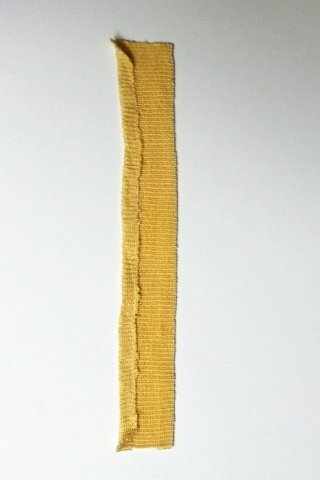 I used contrasting thread for the example below. 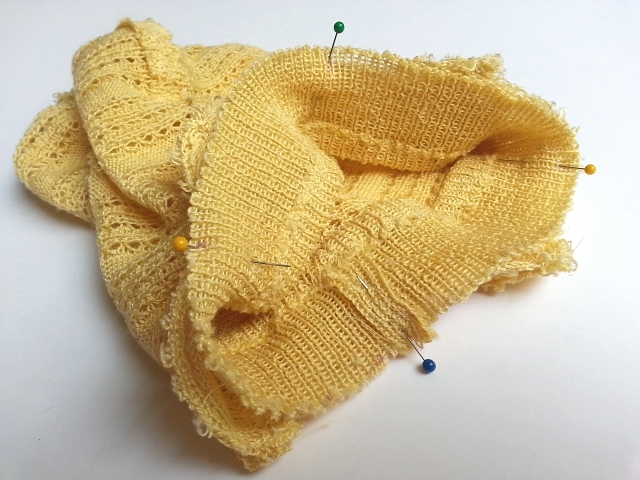 Be sure to test your stitch settings on the scraps of your particular fabric. Repeat for the three remaining seams of your hat. When the four seams are completed and steamed, the hat will look something like this. Yay! You're almost finished! Now it's time for the binding. Step 7. Measure and cut binding. 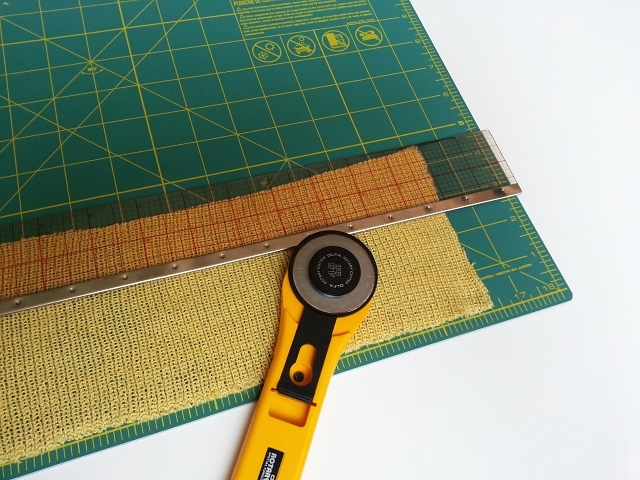 Cut a strip of knit fabric 2 1/2 inches wide and long enough to go around your head, plus an extra 1-inch (for two half-inch seam allowances). 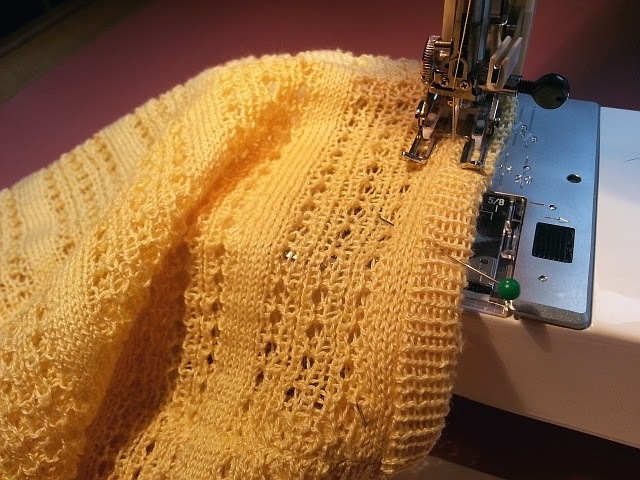 If you're using a rib band from an upcycled sweater, your binding fabric only needs to be 2 inches wide. Step 8. Turn and steam under 1/2 inch on one long side. Step 9. Sew the short ends together with a 1/2 inch seam allowance. Steam seam allowance open. At this point the binding will look like this. Step 10. Mark the raw edges. 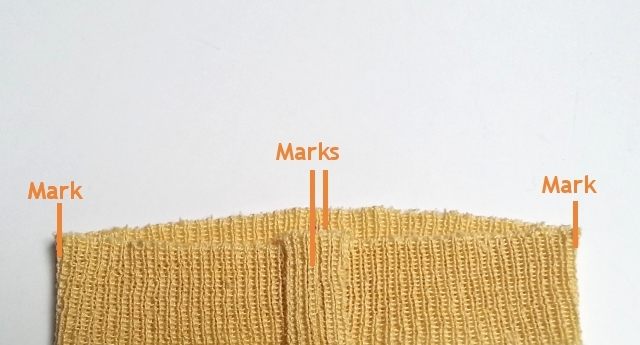 Use your favorite fabric marker to mark the seam. Then mark the halfway point on the raw edge across from the seam. Now match seam to the halfway point and mark the two quarter points. Step 11. Pin the binding to the hat. Match the marks on the binding to the marks on the hat along the raw edges, right sides together. Pin hat and binding together. Step 12. Gently stretch the binding to fit the hat and add more pins. Step 13. 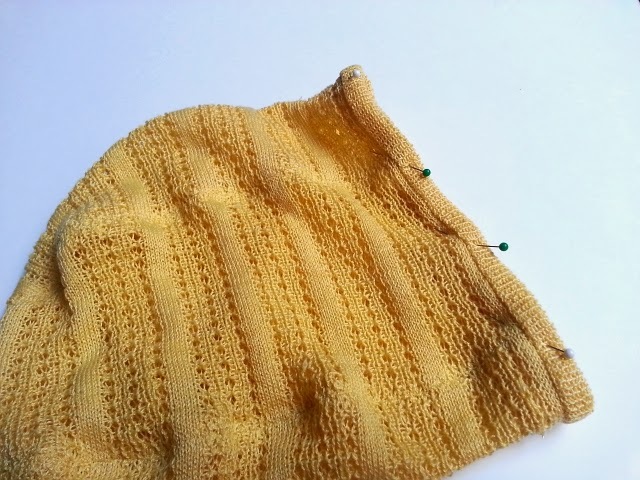 Using a narrow zigzag, sew binding to hat. Use a half-inch seam allowance. My settings for the zigzag were 1.0 mm wide by 2.75 mm long. Now go around one more time, this time at 4.0 mm wide by 2.75 mm long. And be sure to remove pins before they get to the needle! Step 14. Trim seam allowance close to zigzag stitches. Be careful not to cut your stitches, while trimming. 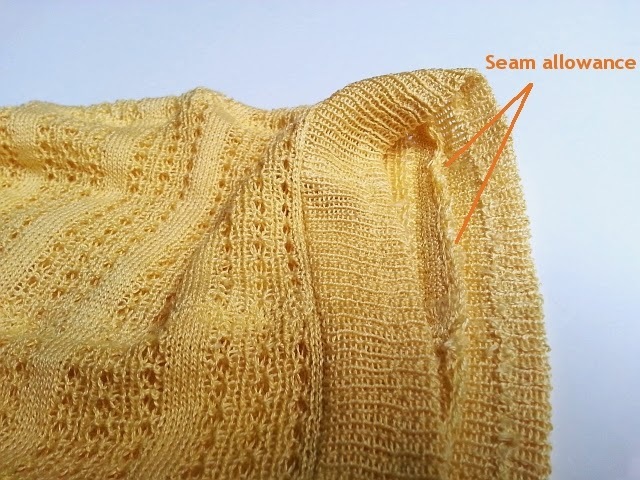 Steam binding toward seam allowance. Step 15. Fold and steam binding under, enclosing and hiding the seam allowance. Step 16. Sew the binding down with a narrow zigzag stitch. Stitch on the hat, very close to the binding. My settings for the zigzag were 1.0 mm wide by 2.75 mm long. Step 17. Sew a few ribbon flowers on one side of the hat. 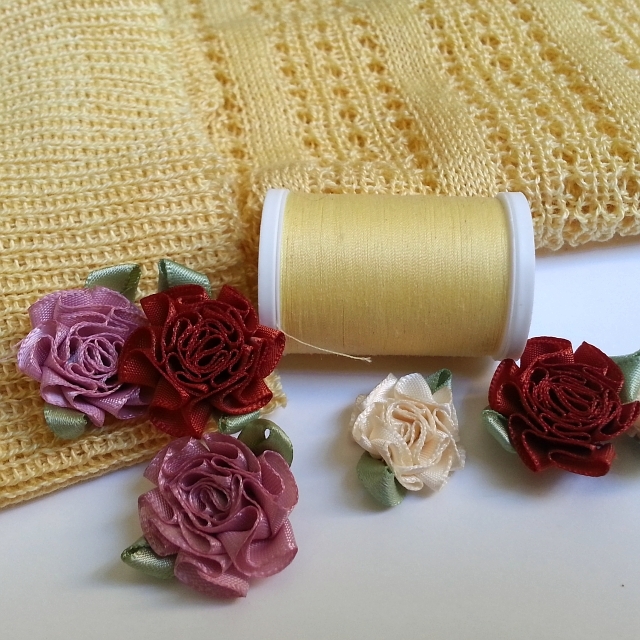 Sew the flowers close to the binding, then try your new hat on. You did it! Now go out and enjoy the spring! I absolutely love this hat, O! Thanks so much for the tutorial. 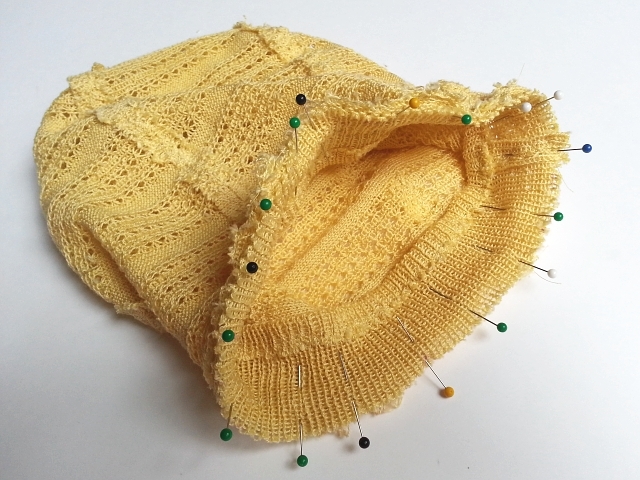 This might be a perfect project for some left over knits. Thank you, Andrea! Yes, it would definitely work with left over knits from a previous project. 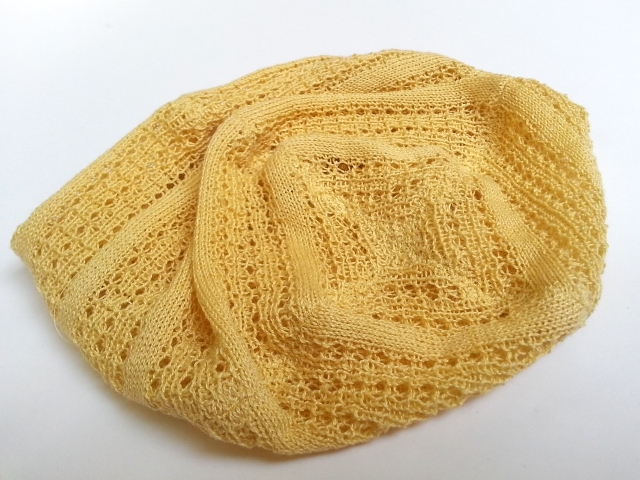 I really loved this hat when you posted it the other day - I am so, so thrilled to see the pattern and tutorial here! I can't wait to make one of these!! Thanks, Kristin. Looking forward to seeing your spring hat! Fantastic tutorial! It's so beautiful! Hope your spring weather is glorious! Oh, this is so pretty! I couldn't tell on IG that it was actually sewn. Very nice! If I ever stumble across a lacy remnant, I'll take a crack at making this hat. Thanks for the tutorial! Thanks, Chuleenan. Would love to see what you come up with!